To create the YourPMO service we have taken our highly successful multi user platform (the technology behind Enterprise, Small Team and Live Editions) and removed all the complexity associated with controlling multiuser environments. What remains is a feature rich and easy to use tool for delivering projects. Planning which supports either Planner files or MS Project as well as the new edit your planner file from a tablet or smartphone capability. Resourcing which brings together demand profiles by project or portfolio irrespective of the plan types you are using. Reporting and dashboards with powerful analysis and high quality direct to print reports off the shelf and available for your personalisation. Powerful project controls capabilities including risks and issues, benefits and finances. Trend Analysis so you can see how your projects are developing over time. Project process in the shape of the most popular methodologies provided through the familiar PIAB method navigation and file management environment including send by emails etc to assist in managing external teams. Our unparalleled experience in delivering the existing Personal Edition as a standalone Project Managers application has given us a great insight into what this demanding and overworked group of individuals need to help them deliver their projects well. All you need is access to the internet and you can work on your projects. YourPMO provides two interfaces optimised for your typical need profiles. When you are in the office you can use the Windows Application on your laptop or desktop for a slick interaction, drag and drop and linking to your local Outlook and connecting to the server via webservices. 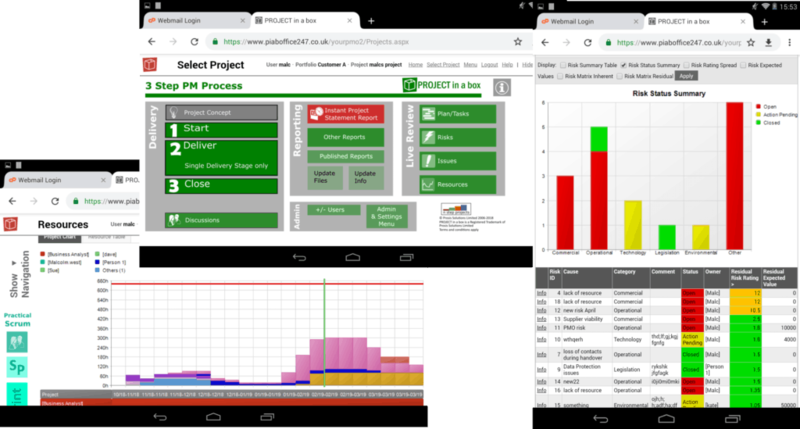 When away from your desk use the browser app on any device including smartphones or tablets to work on your projectsincluding updating content, reporting and controls analysis. As long as your device has internet access you can connect via webservices. Your PMO will work for you whether you have one or many projects. Also for many different types of projects and for differing project complexities. Portfolio capabilities are provided if you have so many projects that you need to group them for analysis and reporting. A range of different method templates are provided in YourPMO. This helps you to adjust your process and tools approaches to the size and complexity of your project. You can also edit your project once created to further match the activities being undertaken. This is done by adding or removing content as required. Adding in further reporting elements is also easy to do. We provide an example project and also training videos for YourPMO. Therefore it is also very easy to be up and running quickly with your project in Your PMO. Your PMO for multiple users? PROJECT in a box also provides the Your PMO capability for multiple users. Live Edition provides a hosted PMO platform with the same capabilities as YourPMO plus more.